The San people were traditionally nomadic hunter-gatherers, part of the Khoisan group, mainly in the Kalahari Desert of Botswana and Namibia and are related to the pastoral Khoikhoi (‘men of men’). Southern African whites used to call the San people, the 'Bushmen'. The San people are connected to Nature, they’ve lived by it and for it. They believe that 'every person has their own wind. It is the wind that blows when they are born and when they die'. 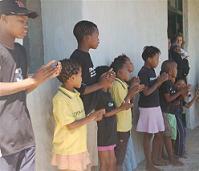 Some numbers of San still live, organised in small groups, in various part of South Africa such as !Khwa ttu. This center is the home, workplace, culture and training centre for Southern Africa’s first people- the San who are one of the world’s oldest continuous cultures. You will have a fantastic time in this place! I have been there for a wedding and it was very powerful. Their accommodation is stunning. Their heritage to the world relates mostly to their art. 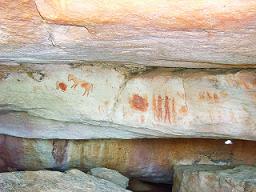 They left their distinctive red designs on rock faces and cave walls all around South Africa. In Cape Town, the Cederberg and Clan William are probably the best places around Cape Town to see san rock-art sites which have been so well preserved. If you are interested in booking a San rock tour, I invite you to contact me and I will organise it for you. One of the best places to stay in Clan William is Bushman's Kloof.